And you have to give credit to Taiwan… they’ve got a good team. They aren’t the most athletic but they’re good. Here are my first-game impressions. Terrence finished with a team-high 18 points, 2 rebounds, and 3 steals. Abueva on the other hand finished with 15 points, 5 rebounds, 1 assist and 1 block that went uncredited. We had some bad calls and we were even robbed of some stats. Both provided hustle, firepower, and swagger. As I Tweeted, Taiwan and everyone else have not seen anyone like Calvin… small by international standards but terrible in more ways than one. I love the swagger. That tip of his away from the basket — that was sweet. The sort of playground move that he perfected as a youngster in Pampanga. I’ll say this though for Calvin… when he gets that ball you can’t wait to see what he will do with it. That’s a compliment that I reserve for the likes of Jayson Castro. What a talent. Moala Tautuaa had a creditable outing. He was obviously getting his baptism of fire in a competition like this and he will no doubt perform better. Some of the fouls called against him are at most contestable. But that is international basketball for you. Tautuaa finished with 4 points and 9 rebounds. 16 points, 3 rebounds, 3 assists, and 5 steals. 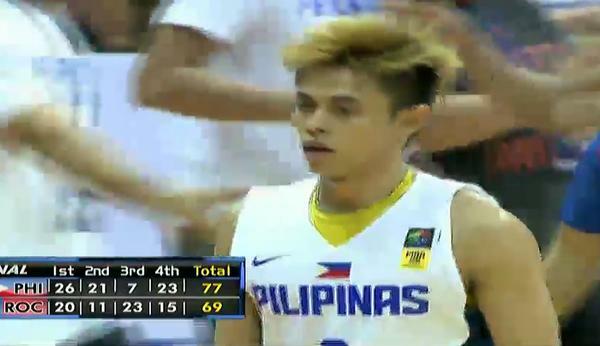 None bigger than snatching away Taiwan’s last gasp attempt to tie the match in the endgame.